We are assailed by new writing. It could be the latest John Grisham or Lee Child, Rose Tremain, Haruki Murakami, Joanna Trollope, Brett Easton Ellis or Peter Carey. The publicity machines of the big publishers are always loading up their cannons. So what prompts us to turn to the classics? Any number of things. A film, TV or radio adaptation we come across; an anniversary; the recommendation of a friend; a quotation we stumble into that suddenly sparks an interest in its origins – and many other serendipities. I sat down to write this piece with one association in my mind, and others began to spring to my attention. It began with The Death of Yorick which led me to Laurence Sterne; then came the drip-drip info feed regarding Dan Brown’s next blockbuster which apparently has, as part of its springboard, not some variant on the Holy Grail but the powerful imagination of Dante Alighieri; and then I remembered that this year is the centenary of the first publication of Swann’s Way, in which Proust first set out on his travels down memory lane. Well – phew! Those three links alone would keep anyone going nicely for months of classic reading without a moment of diversion for some tense Scandinavian murder fiction from Nesbö, or Bella Bathurst’s fascinating history of The Lighthouse Stevensons (a recent diversion of mine) or a hard-edged expose of some contemporary political nasty. BUT – ladies and gentlemen, there is no time for that in the first half of 2013. You have scarcely time to get listening to the above mentioned classics in order to be up to date! Let’s start with Dante. It is unlikely that there will be a book in 2013 backed by more marketing dollars than Inferno, Dan Brown’s fourth Robert Langdon mystery. What takes Mr Langdon into the ‘mysteries’ of medieval Italian literature remains to be revealed – or more to the point will be on 14 May. So, you have a little over six weeks to prepare yourself by getting to grips with the original. Yes, if you have never read Dante’s poem, one of the principal pillars of Western literature, because you thought it was too old, too difficult, too arcane or too grim, now is your chance. It doesn’t come easier or more gripping then when listening to the inimitable Heathcote Williams reading Benedict Flynn’s sparkling and fresh translation of Inferno, prepared especially for Naxos AudioBooks. If you buy the CD or download it from this site, it comes with useful notes explaining key references for those not familiar with medieval Italian historical and religious allusions. They are very helpful, I can tell you! Even better, you can also, for a very small sum, buy the etext for Kindle (£2.56) or from the Apple iBookstore (£3.49) and follow the text as Heathcote reads. You can be assured you will never forget the experience or the images. And it may take you on to Purgatory and Paradise to have the complete Dante under your belt. 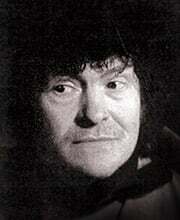 Our recording of Heathcote Williams reading The Divine Comedy was directed by Roger Marsh, composer and professor of music at York University who also directed our James Joyce. A few years ago, he set one section of Inferno for The Hilliard Ensemble, the outstanding four-man classical vocal group, in a work called Il Cor Tristo which has been heard in concerts all over the world. Last November, the CD label ECM recorded Il Cor Tristo (in a monastery in Austria) for release later this year. Following the success of Il Coro Tristo, The Hilliard Ensemble commissioned a new work from Marsh to mark the group’s 40th – and final – season, and Marsh has already started on the piece. It is called, he tells me, The Death of Yorick. Not Shakespeare, you understand, but the demise of Parson Yorick in one of the greatest books of humour in the English language, Laurence Sterne’s Tristram Shandy. It is particularly appropriate, of course, because 2013 marks the 300th anniversary of Sterne’s birth. Not surprisingly, the writer’s home, Shandy Hall in the Yorkshire village of Coxwold, has been – and continues to be – the scene of much merriment and celebrations. 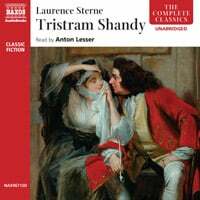 So, now I exhort you, if you haven’t done it already, to make 2013 the year you listen to Tristram Shandy. It is one of the most uplifting, enjoyable of literary jaunts: the longest shaggy dog story that is peopled with a host of entertaining characters and incidents. You can listen in two ways: to the abridged version running for five hours read by the late and very lamented John Moffatt; or you can immerse yourself in the whole thing, and be rapt by the comic talent of Anton Lesser for 19 glorious hours. I have heard both, and there can be no more perfect example of two outstanding actors giving two different readings, both hugely rewarding. Why not go to the pages and listen to the samples! (abridged, unabridged). Finally, there is Proust. Yes – I have written about Neville Jason’s readings (also offered in abridged or unabridged form) on numerous occasions and I do not offer one word of apology. 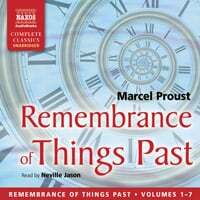 Swann’s Way, the first volume of Remembrance of Things Past was first published (Proust had to pay for it himself!) in 1913. Do you need another prompt to embark upon this Everest of 20th century literature? Can you really, in this centenary year, turn aside (again?!) and say to yourself that you will leave it for another year? Take the plunge. Start with the abridged version of Remembrance of Things Past if you want: there is no shame in doing this. Swann’s Way and Swann in Love are each 3 CDs (3 hours 50 minutes); and 39 CDs (49 hours) will take you through the whole abridged set. If you want an even faster route through the whole work, Neville Jason has provided an 8-hour overview, with the best/key bits introduced to set the scene: The Essential Remembrance of Things Past, 9 CDs (just under 10 hours). Or, if you are really committed, you can put life on hold and commit yourself to every work: The Complete Remembrance of Things Past on 120 CDs, (153 hours). BUT – don’t pass by on the other side.